In order to participate in sorority recruitment, potential new members are required to register with the Office of Fraternity & Sorority Life or the College Panhellenic on the university campus and pay a registration fee by a certain deadline. Registration opportunities are often also available during university orientation sessions. ​If you have not obtained recruitment information by mid-July, we suggest contacting the campus Office of Fraternity & Sorority Life office for further details. For your convenience the Offices of Fraternity & Sorority Life links for Arizona universities are on this page. To discover more information, click on university logos to learn more about recruitment at each university. 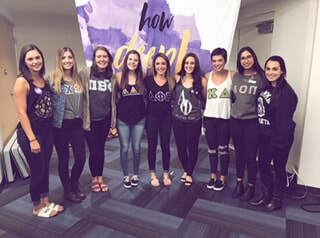 ​During and after the preference rounds of formal recruitment at ASU and NAU, sometimes local alumnae may have the opportunity to assist with reading the MRABA script to PNM's. If you are interested in volunteering please e-mail collegiaterelations@phoenixpanhellenic.com. The Sorority Life website by National Panhellenic Conference provides general information about the sorority recruitment process and member expectations. Included are insights for Mom and Dad. ​Letters of Recommendation or Reference for prospective members planning to participate in Sorority Recruitment can be requested in advance from alumnae according to their sorority guidelines. Please plan well ahead and allow a minimum of 60-90 days in advance of recruitment dates for letters to be processed by Panhellenic and its alumnae members. Provide a personal resume (which should include a list of activities, honors, GPA and a brief personal statement), a photo, name of university and its recruitment dates, as well as a list of sorority chapters with their addresses on your campus. As a courtesy, prospective members should provide postage to alumnae if hard copies of recruitment packages are required to be mailed. Please note that not all Greek organizations and/or Universities require letters of recommendation. Be sure to check with the Office of Fraternity & Sorority Life or campus Panhellenic well in advance for their requirements and suggestions regarding campus Recruitment practices.